When a motor burns out, do you rewind it or replace it? Back in Issue 3 of Smart Energy User we introduced this important topic, and here and in our next issue we explore some of the key questions in more detail. Sometimes — for one of the reasons discussed in this article — the obvious best approach is to rewind the motor. If the magnetic core of a failed motor is undamaged and appropriate procedures are followed, a rewound motor will retain its original efficiency. Properly repaired, a “standard” efficiency motor will have its original “standard” efficiency, and an energy-efficient (EE) motor will have its original high efficiency. On the other hand, those times when a motor has failed are also opportunities to upgrade motor efficiency. Especially if the failed motor is 10 or more years old — perhaps with unknown efficiency, and possibly having been improperly rewound in the past — you will want to seriously consider all the options, and look into the economics of replacing it with a new EE motor. The more horsepower a motor delivers, and the more hours per year it runs, the greater the operating cost and the more important the motor’s efficiency turns out to be. Small motors, and motors that are used infrequently or only for short periods, don’t cost a lot to run even if they are inefficient. But when a large horsepower motor operates for thousands of hours per year, the operating cost is substantial. And, that motor’s efficiency can have a significant effect on the company’s bottom line. Induction motors employ an armature that rotates within a fixed stator, with a small air gap between the two. A typical motor stator is shown below. filling the slots in the core. In this example, those parts of the windings which extend beyond the core are laced in place. In some motors the windings are held in place with varnish or epoxy resin. Motors fail for various reasons. A frequent cause is breakdown of the stator winding insulation due to repeated motor overheating, extreme one-time heating (possibly caused by loss of one of the three electrical phases), or water entering the motor. Normally, failure due to breakdown of stator winding insulation does not damage the core, and the core can be rewound if the old winding is carefully removed. Bearing failure is another cause of motor failure, and when a motor fails for this reason the core is often damaged by the armature rubbing against the stator iron and burring the edges of the laminations. A stator with this kind of damage cannot normally be repaired without altering motor performance characteristics, and if that is the case, the motor should be discarded. Whatever the cause of a motor’s failure, it is important that the stator’s iron core be carefully inspected for damage before rewinding is attempted. Rewinding a damaged core results not only in reduced motor efficiency, but also in higher motor temperature — increasing the likelihood of yet another motor failure. 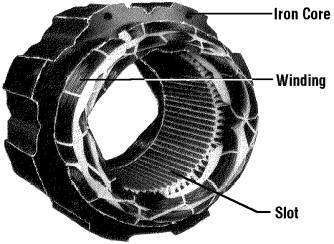 Before a stator core can be rewound, the original windings must be removed. There are various ways of doing this. Many motors — especially those in which the windings are just laced in place — can be easily “dry stripped” or “cold stripped.” Here, the ends of the windings are cut off and the wires within the slots are simply pushed out. · heating the stator in an oven to loosen the old windings. As mentioned in the Issue 3 article, heating the stator core to too high a temperature during this “burnout” process damages the core and results in a less efficient motor. Fortunately, it is now possible to conduct proper thermostatically-controlled burnouts of motor stators ranging in size from less than a horsepower to as large as 200 or 300 horsepower. If efficiency must be maintained because operating cost is high, and if the stator needs to be heated in order to be stripped, ask your rewinder to have the burnout done using thermostatically-controlled equipment. Recent experimental work1 by the Canadian Electrical Association confirms the need for temperature control in the burnout process in those situations where maintaining efficiency is important. Especially for older, standard-efficiency motors that are likely to have their stator cores made of “C3 core plate,” the oven temperature should be set no higher than 650°F. The research found that the stators of newer, more energy-efficient motors — stators made of C4 and C5 core plate — could handle somewhat higher temperatures without degradation. This newer core plate was also able to go through the burnout heating process at least four times with no problems. In contrast, cores made of C3 core plate showed increased loss with each subsequent burnout. Production downtime can be extremely costly, and having an important motor burn out will sometimes shut down a production line. Having a motor rewound often takes less than 24 hours. Acquiring a new replacement motor is likely to take longer. Island shops have been known to work all night to repair a critical motor so the customer’s production line can be up and running the next morning. All of this needs to be considered when making the decision to repair or replace. One circumstance where motor rewinding is invaluable is where the failed motor is of non-standard size or operating characteristics, and an off-the-shelf replacement is not available. Another is where non-standard windings would be beneficial. Ordinarily, you want the motor rewinder to reproduce the original windings exactly: same wire size, same number of turns, same (or higher) insulation temperature rating. There are special circumstances, however, where a modified rewind can actually improve things. One concerns motors (often older motors) where the manufacturer did not completely fill the stator slots with wire. Here, the improvement involves keeping the number of turns the same but increasing the wire size — thereby cutting losses, increasing the efficiency of the motor, and reducing its operating temperature. Another special circumstance concerns the abnormal voltage conditions found in some plants. If the supply voltage to a 208-240 volt motor is only 200 volts, the motor will overheat at full load. One remedy is to raise the supply voltage. Another is to rewind the motor in such a way that it becomes a 200 volt motor operating on 200 volts. 1. The stator core will be carefully inspected for damage before the windings are stripped. If damage is evident, no further work will be done until you and repair personnel have had a chance to discuss the matter. 2. The old windings will either be cold stripped, or stripped after baking in a temperature-controlled oven at a setpoint temperature no higher than 650°F. 3. The new windings will have the same number of turns as the original windings, and will use wire having the same (or higher) insulation temperature rating. This wire will either have the same gauge as the original, or parallel wires will be used which together have the same total cross-sectional area of copper. 4. The original bearings will be replaced with new bearings of the same type. There are excellent books, software, and other information dealing with the efficient use of large (1 to 200+ hp) motors. Mentioned below are two excellent books, and while their content overlaps to some extent, each has particular strengths and features. · those who repair them. The book has chapters on the technical characteristics of motors, operating considerations, controls, motor repair, preventive maintenance, and cost/payback analysis. It also contains some handy appendices, including the Lincoln Motors Troubleshooting Charts, a Motor Purchase Specification Form, Electric Motor Repair Specifications, and forms for use by motor repair shops to keep records on the motors they repair. It is available from Penn Well Books of Tulsa, Oklahoma. Phone: 800-752-9764 or 918-835-3161. ENERGY EFFICIENT MOTOR SYSTEMS: A Handbook on Technology, Program, and Policy Opportunities, by Steven Nadel (379 pages, 1992, $29 U.S.) is a more wide-ranging book. It has some chapters on energy policy issues that probably would not interest most readers of this newsletter. But there is also much solid technical content in chapters entitled Motor Technologies, System Considerations, Motor Control Technologies, and Motor Applications. It is available from the publications office of the American Council on an Energy Efficient Economy. Phone: 510-549-9914. Fax: 510-549-9984. If you are interested in motor-related software, want additional information about motors, or have specific questions, call Mike Proud or Ron Estabrooks of the Energy and Minerals Section at 368-5010 (toll free). 1. “Preliminary Highlights of Motor Industry Study By Canadian Electrical Association,” CURRENTS: The Monthly Newsletter of the Electrical Apparatus Service Association, Volume 30, No. 7, July 1996.